en: This is the community discussion page; see also requests for a bot flag. 6 Bonde Veirsky i Norske Folkeeventyr, 1852. This is the most important fairy tale book that Asbjørnsen and Moe edited and released, and it could be nice if all the texts were prepared for proofreading. I started on 59. Bonde Veirsky, https://no.wikisource.org/wiki/Page:Folkeeventyr_(1852).djvu/426, but after reading the first page, there was no more. Is there anyone who is able to clarify more of this book? And very well finish Bonde Veirsky first. Hjelp til med å oversette til ditt språk Hi everyone. The Readers web team has recently begun working on exposing issue templates on the mobile website. Currently, details about issues with page content are generally hidden on the mobile website. This leaves readers unaware of the reliability of the pages they are reading. The goal of this project is to improve awareness of particular issues within an article on the mobile web. We will do this by changing the visual styling of page issues. 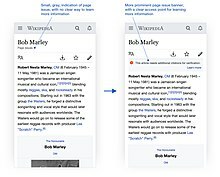 as announced previously, permission handling for CSS/JS pages has changed: only members of the interface-admin (Grensesnittadministratorer) group, and a few highly privileged global groups such as stewards, can edit CSS/JS pages that they do not own (that is, any page ending with .css or .js that is either in the MediaWiki: namespace or is another user's user subpage). This is done to improve the security of readers and editors of Wikimedia projects. More information is available at Creation of separate user group for editing sitewide CSS/JS. If you encounter any unexpected problems, please contact me or file a bug. The Community Wishlist Survey. Hjelp til med å oversette til ditt språk. Avansert søk blir en standardfunksjon på din wiki 28. november. Dette nye grensesnittet lar deg utføre spesialiserte søk på søkesiden, selv om du ikke kan all søkesyntaksen. Avansert søk kommer fra ønskelisten til de tyskspråklige prosjektene. Det er allerede en standardfunksjon på Wikipedia-utgavene på tysk, arabisk, persisk og ungarsk. I tillegg har mer enn 40 000 brukere på tvers av alle wikier prøvd betaversjonen av funksjonen. Kom gjerne med tilbakemeldinger på tilbakemeldingssiden. Denne siden ble sist redigert 12. apr. 2019 kl. 19:35.